20. 11. 2013 | The Italian quantum physicist is considered a leading expert in her field. She currently holds a chair of physics at the University of Innsbruck, Austria. She was nominated for the Humboldt professorship by the University of Ulm, Germany. Francesca Ferlaino has studied physics in Naples and obtained her doctoral degree at the European Laboratory for Non-Linear Spectroscopy LENS in Florence, Italy. Since 2012, she has been professor for atomic physics at the University of Innsbruck and is director for the physics research programme as well as for an international research group on the natural element Erbium. "In 2012, she was able to create a Bose-Einstein-condensate of erbium for the first time", Karl Joachim Ebeling explains, University president in Ulm and a physicist himself. The University of Ulm had nominated Prof. Ferlaino for the Humboldt professorship. Francesca Ferlaino | is a leading expert in her field of quantum physics. Francesca Ferlaino's research group in Innsbruck is called "Ultracold atoms and quantum gases". Her research is dedicated to the experimental study of fundamental few- and many-body phenomena realized with ultracold quantum gases of atoms and molecules. The key advantage of such systems is the high degree of control achievable over their internal and external degrees of freedom. Interactions between particles, trapping environments and quantum states of atoms can be adjusted almost “on demand”, opening enormous possibilities for studying effects belonging to very different branches of physics. The main focus here is the realization of exotic states of matter such as giant three-body states, quantum dipolar gases of highly magnetic atoms and ultracold polar molecules. Ferlaino has received an ERC Starting Grant for her ground-breaking research in the past, as well as a START award from the Austrian science fund FWF, and has published her results in numerous articles in prestigious journals. 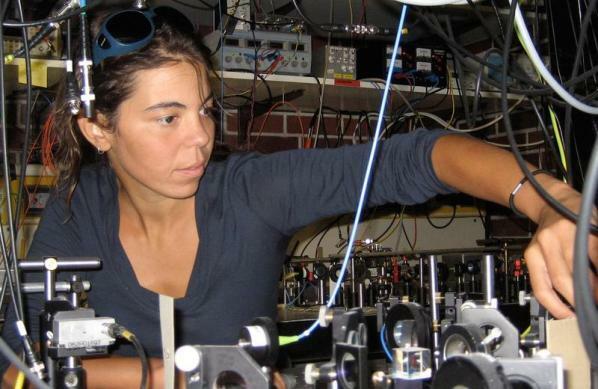 Besides working with erbium and Bose-Einstein-condensates, her research is focused on the Efimov effect, ultracold molecules and exotic quantum gases. She is 35 years old and has two children, the youngest was born this summer. The Humboldt professorships enable universities to offer top international researchers competitive conditions and long-term prospects for working in Germany. The award amount is earmarked to finance the first five years in Germany. "I am delighted that the Alexander von Humboldt professorships spark interest in Germany amongst excellent international researchers. This clearly demonstrates how attractive our research location has become. It is especially pleasing that this year, for the first time, three women have been selected to become Humboldt professors", says Federal Minister of Education and Research, Johanna Wanka.